From Cork, you will come to Post Office on right, take turn next to Post Office and follow road around to the rear of Castle Hotel and take a left just a silver gates. We spend a lot of time travelling around Ireland and are always on the lookout for interesting places to stay and eat. Very frequently we travel from Cork over to Kerry and I really like that drive that takes you into the lush rugid rocky region of North West Cork. The market towns in the area are fascinating, Kanturk, and Macroom. Macroom is a town of extraordinary history, one of the earliest towns where milling was carried out, with lots to do and investigate in the local area. The town is dominated by Macroom Castle walls and grounds with old stone arches and guns providing a rich historic backdrop to the town It was built in the time of King John and later occupied by the MacCarthy family who reigned supreme in the area. I have a great regard and love for family run hotels that have been of service to their community and area for generations. We see so much of this Abroad in France and Italy but we have just as many wonderful such establishments here in Ireland. One of these is the Castle Hotel Macroom which has been in the same family now for 60 years plus and is owned and run by brothers, Don and Gerard Buckley. 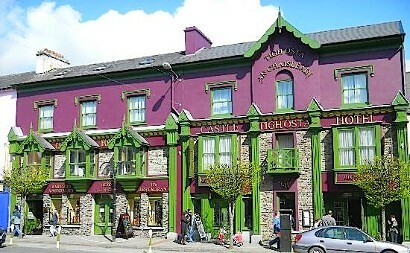 The Castle Hotel has buckets of atmosphere and charm and a lovely friendly staff who are welcoming and warm. It is a 4 Star Hotel with all modern facilites and very comfortable accommodation. The bedrooms are in the contemporary style of today with King sized beds, Plasma screens and whirlpool baths. Much use too has been made of lovely rich fabrics and drapes and you will sleep here in comfort and style. Some of the rooms have Queen sized beds with an extra single bed, which can be very handy. They also have interconnecting and family rooms available. If you want to push out the boat they also have two suites. Not only that but if you want to bring Fido – the dog – not the husband – he will receive a welcome doggie bag with a toy, a treat and clean up bags. In room he will have his own food and water bowls with fresh mineral water no less!! Get this for posh poodle – there are Pet Concierge Services available nearby including a dog walking and grooming service! Great! I love to see owners being able to travel with their pets as they do so much in France. There is also a fine Leisure Centre with a 16 metre deck level heated swimming pool, a children’s pool, a massage pool, steam room, state of the art gym with cardio vascular and strength training equipment and a Holistic Therapy Suite. Believe me you won’t be hungry at The Castle Hotel as they have good food available pretty well throughout the day. Dan Buckley’s Bar is a great spot at lunchtime, Brendan always enjoys a pint, and the bar menu is top drawer with really good offerings from burgers, fish n chips and scampi to butternut squash or duck leg confit. They also do great boards and slates of seafood, cheese and meats, and as well as food throughout the day they have a great Carvery Lunch from 12 noon to 3.30pm. They also have the Next Door Café if you fancy scrummy cakes, buns, and sandwiches with a coffee fix. B’s Restaurant is bistro style, it is open for dinner, and is a popular spot with locals. Starters might include a Tapas plate, tiger prawns in chilli & garlic butter or crispy Tipperary cheese and garlic stuffed mushrooms. Mains include a prime 10oz Mike Twomey' sirloin steak, cooked as you wish, with French fried onions, served with peppercorn sauce or garlic butter. Pan fried duck breast with braised red cabbage and an orange sauce, or BBQ chicken stuffed with Gubeen chorizo. Finish off with a warm rich Belgian chocolate fudge pudding with chocolate sauce or a red berry pavlova or, what I love, a plate of Coolea and Gubeen farmhouse cheeses with Macroom oatmeal crackers.